Justice Anthony Kennedy announced that he will be retiring at the end of July. President Donald Trump told reporters Wednesday that his administration "will begin our search for a new justice of the United States Supreme Court that will begin immediately." Trump told reporters that his next nominee will likely come from a list of 25 candidates drafted in part by his campaign and updated after the election. President Donald Trump greets Supreme Court Justice Anthony Kennedy after addressing a joint session of Congress in the Capitol's House Chamber, February 28, 2017. 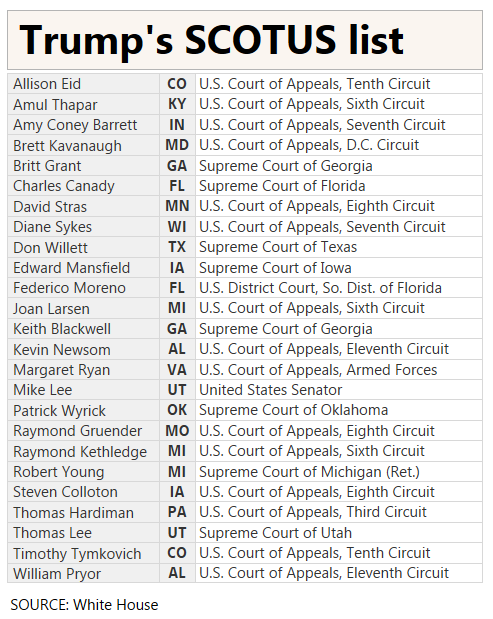 President Donald Trump will likely get to appoint a second judge to the Supreme Court, and his administration has already published a list of potential candidates for the bench. Trump told reporters Wednesday that his administration "will begin our search for a new justice of the United States Supreme Court that will begin immediately." The remarks came shortly after Justice Anthony Kennedy announced that he will be retiring at the end of July, calling his tenure on the bench the "highest of honors." The announcement is hugely significant for Trump, who now has another chance to further reshape the ideological composition of the highest court in the country, after appointing Justice Neil Gorsuch last year. Gorsuch filled the seat that opened up after the death of Justice Antonin Scalia. Kennedy’s retirement also compounds the already-intense pressure on Democrats desperate to take back majorities in the House of Representatives or the Senate in the November midterm elections. But Trump could potentially complete the appointment process for a new justice before Democrats get a chance to stop it. Trump nominated Gorsuch on Jan. 31, 2017; he was confirmed by the Republican-controlled Senate three months later on April 7. The midterms are more than four months away, on Nov. 6. Sitting next to the president of Portugal, Marcelo Rebelo de Sousa, in the Oval Office, Trump told reporters that his next nominee will likely come from a list of 25 candidates drafted in part by his campaign and updated after the election. "We have a very excellent list of great, talented, highly educated, highly intelligent, hopefully tremendous people. I think the list is very outstanding," Trump said. His nominee "will be somebody from that list," Trump added. Two of the candidates on Trump's current list, Judges Thomas Hardiman and William Pryor, were the likely frontrunners alongside Gorsuch in January 2017, CBS News reported at the time. Sen. Mike Lee, R-Utah, is also included on the list. In a statement to CNBC, Lee said he would accept the nomination from Trump if it were offered to him. “I started watching Supreme Court arguments for fun when I was 10 years old. So if somebody asked me if I would consider that I would not say no. But the president’s got a decision to make and I trust his ability to make it and make it well,” Lee said.